For thirty years the world famous Rick's Cafe has proven an enduring icon on the landscape of Negril, Jamaica. From meager beginnings back in 1974, Rick's Cafe was a small upstart cliff side haunt offering an alternative to Negril's majestic seven-mile beach. For tourists and locals alike, a reality and vibes was soon set in stone. 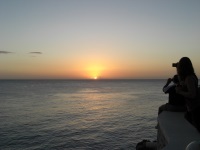 The cliffs boast a magnificently unrivaled view of the Caribbean's most spectacular sunset. Rick's grown into Negril's premier gathering spot and has remained such for over a quarter of a century. Like moths to a alike, a reality and vibe was great to flame, from Rastas to Rolex, literally millions of our friends have joined us over the years in this most raucously public yet uniquely spiritual and personal tradition called Rick's Cafe. Some are so moved that they choose to leap off our cliff forty feet above the crystal blue waters of the Caribbean Sea. In doing so, they are taking part in something bigger than themselves. If even for a few fleeting moments, with one step, they are joining thirty years of friends who have previously chosen to let the concerns of a life far, far away dissolve into the sea like the setting sun they have all come to worship. Voted one of the ten best bars in the world, Rick's Cafe is what Negril is all about. As one of Negril's premier attractions, come enjoy incredible cliff jumping while fine dining on the cliffs, which boast a magnificently unrivaled view of the Caribbean's most spectacular sunset. With live reggae music every night, the World Famous Rick's Cafe is a must!